My Canon PowerShot Elph 300 is no longer up to the task of keeping pace with my action-packed son. Time to upgrade and look for holiday shopping deals. My two-year-old son moves fast. Sometimes he’s not moving forward. The good news is I can still keep up. The bad news is my digital camera gear can’t. Any of your child’s various activities present you the opportunity to take amazing photographs. But the action is often hard to capture. If you’re trying to use natural light at home, your pictures can end up looking blurry. Unless you’re shooting outdoors, most pocket cameras don’t have lenses that let in enough light or big enough CCD (charge-coupled device) image sensors to freeze the action. In the few seconds it takes for your pocket camera to prep for the next photo, your child is already in the next room. Look, I’m no pro photographer, but I know enough that one camera cannot possibly meet the needs of all situations. So I’ve got more than one. The problem is I feel I’m still not getting it done. Sure, people tell me what great shots I take of my son, and I do get some. But only I see the many shots I still can’t get right. Those magic photo moments present themselves when you least expect it. You need a camera you can whip out, quickly turn on and snap. 2011 Canon PowerShot Elph 300 HS. I like my tiny Elph. It takes great pictures and has a nice 24mm wide-angle lens, which lets me capture more of my son, when he’s playing right next to me. But it can’t handle that action moment unless you’re outdoors. Sure, like much of the planet, you’ve also got a smartphone in your pocket that can take pictures. So you may feel like you don’t need another bulge in your pocket, but your phone is even less capable at capturing action shots. It’s good for taking a posed photo, and that’s about it. Doesn’t everyone understand if you’re serious about getting great photos of your kids, you’re going to need a Digital SLR with a big CCD sensor and a decent lens? Sure it’s going to cost you some coin, but the price of entry into the DSLR world isn’t as high as it used to be. Consumer DSLRs these days start at only a few hundred dollars more than their point-and-shoot cousins. I’m currently using a 2009 Canon EOS Rebel T1i. It’s tough to carry around all the time. And when you’re schlepping the diaper bag, the toy bag and the stroller, you end up leaving your DSLR behind more often than you’d like. But it remains your only hope to consistently capturing great low-light action photos. One reason why entry-level DSLRs are so affordable is they typically come bundled with inexpensive kit lenses that are simply not that great. Still, these lenses are better than the lenses in your little pocket camera. So it’s still a decent choice for the price-conscious consumer who wants to take better pictures, right? Any article you read about these bundled kit lenses say they’re good to learn with. After a while, some photographers see the limitations and find themselves wanting more. And I’ve reached that point. I’ve been using Canon cameras for years and have been generally happy with my compact point-and-shoot cameras and my DSLR. My frustrations have surrounded the elusive toddler photo, and as I documented above, this problem simply lies with the limitations of the tools I’ve chosen. And as I look to expand my photographic capabilities, it’s a hard move to choose another partner. There’s a certain coziness that has set in by using a common Canon user interface. Each camera generally operates the same way. I like H.264 movie files, because they are better to edit with in Final Cut Pro. And in Final Cut Pro X, you don’t have to first transcode these movies to a friendlier codec like ProRes to edit with. FCP X will work natively with the H.264 files, saving me tons of time, duplicated media and extra file storage. You can’t go wrong sticking with Canon. But in studying recent reviews of Canon’s non-DSLR camera line up, Canon has slipped from grace a bit against the competition. Currently, The Sony Cyber-shot DSC-RX100 is universally regarded as the best compact point and shoot out there. A major reason for that is the large, one-inch DSLR sensor they’ve somehow crammed into it. I would leave Canon in a heartbeat for this. The RX100 shoots movies with the silly HVCHD codec, which won’t work with Final Cut Pro. So I would have to return to transcoding my movie files, which I simply can’t bear, now that I’ve tasted freedom from that unspoken tech burden. Sony- please call me when your movie codec starts to play nice with Apple. So what’s a demanding amateur photographer to do if he wants to go with a Canon? There are thirty-five options, which can quickly get confusing. One way to sort through all the choices is on sortable.com, which allows you to compare the specs and reviews between two cameras. capture your child’s elusive low-light highlights. Reviews agree that this camera is a solid choice and does well in low light. However, it’s no longer the darling it once was with Sony’s RX100 out there. This is a newer version of the S95 and S100, both of which are still on the market. It’s the best pocket camera Canon has, but it’s not as good as the G15. So you’ve got a dilemma. Should you go with the better, bulkier camera you’re not going to take with you all the time, or keep something not quite as good with you all the time in your pocket? This has a 20x super zoom lens, which I once thought would solve all my problems. I bought the Canon PowerShot SX230 during the summer of 2011, and quickly realized that zooming into the action from far away doesn’t necessarily make the action any clearer. Then, the flash stopped working, and the battery wouldn’t hold a charge. Maybe it didn’t help that the camera took a nasty four-foot spill onto a cement sidewalk on its maiden voyage. I haven’t repaired the SX230, because I’d rather put that money towards my toddler action-shot solution. And the SX260 probably isn’t going to help there. So none of the above choices really attack my problem sufficiently. (And by the way, if you’re thinking about Canon’s new PowerShot G1 X for a whopping $800, put your wallet away. Nope. That’s just putting money in the wrong place. I need to graduate to the prosumer camera world, and just buy a better lens for my old T1i. I have a friend I work with who is also a professional still photographer. When I told him my story, he suggested I buy the Canon EF 50mm f/1.4 USM lens. This professional 50mm lens would be a good first glass purchase outside the kit lens world. It’s a prime lens, which means it doesn’t zoom. But prime lenses generally give you a better picture for the price. 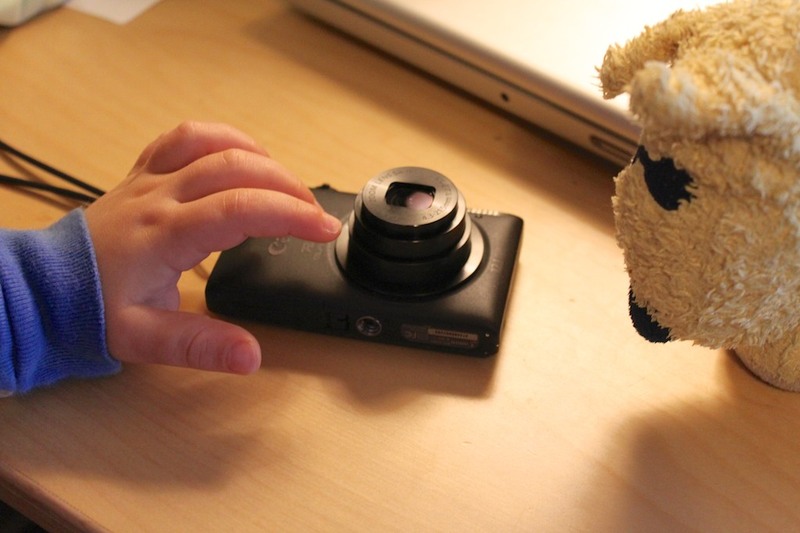 He said this 50mm lens would give me a little bit of reach… so I wouldn’t have to be on top of my toddler. My feet would have to do the rest. This lens costs $339, including a $60 Canon discount as I write this. Good zoom lenses easily go into the thousands! Do professional photographers spend more money on their glass than their cameras sometimes? At these price points, you can see why the typical amateur photographer isn’t playing in this sandbox. All I know is when my toddler is happily playing in his sandbox, I just want to take a good picture! By now, digital camera technology has reached a certain maturity. Buying last year’s model of a good camera is a great idea, because by now it’s heavily discounted. So there’s really no perfect solution. The G15 is too big for your pocket. The S110 isn’t as good as the G15. The big zoom of the SX260 isn’t going to make the blurs go away. Buying last year’s DSLR at a discount is a deal, but I need glass. And good glass is expensive! I pulled the trigger and bought the Canon 50mm lens. I bought it online from Adorama, because they threw in a lens UV filter and cleaning kit for the same price. Option #5 came in particularly handy on Black Friday at the Lester household. The S100 would do a much better job in my pocket than my still decent Elph 300. I know it seems like an indulgence, since the new glass is my solution. After replacing my Elph 300 with the new S100 in my pocket, I would move the Elph into the kitchen for the rest of my family to use, replacing our old Canon SD960 from 2009. This retiring PowerShot is the Dorean Grey of my camera fleet. It’s really taken a beating over the years and has kept on ticking, although its photos now look kind of muddy. Plus, its faceplate is being held on with duct tape! I bought some glass and upgraded my pocket camera. No matter how fast he’s moving! But I’ve clearly blown my holiday shopping budget on tech gear for myself. Time to focus on my son, and the rest of my family! Just an FYI to anyone reading this, you can get a used Canon G150 now for about $250 nowadays, and it’s still a great camera even by 2018 standards. Especially if you’re just a casual photographer looking to take pictures of your children and things like that, it’ll be more than you need in terms of features/etc. Once you get a DSLR you’ll never go back to point and shoot. In fact, you won’t even know how you ever did without a DSLR in the first place. Point and shoots are so crappy by comparison! Seriously, if you’re going to buy a point and shoot camera you might as well just use your smartphone camera.